Named for it's extreme thickness, this "double cut" chop is just that...double a normal chop! Upwards of 1.5-2" thick, these suckers are hard as heck to nail using traditional cooking methods, and are the perfect option to let your sous vide meal shine! Rosy pink all the way through, and packed with juicy flavor. 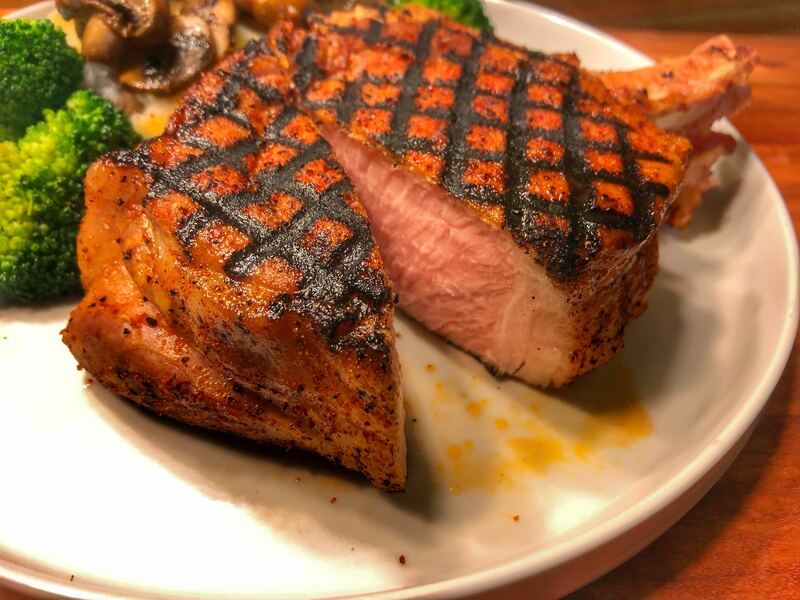 Season pork chop with BBQ rub. Place in resealable ziploc or vacuum bag. Heat heavy-bottomed grill pan over high heat, or heat grill/BBQ to high heat. Remove pork from bag, and dry thoroughly. Place pork in hot pan or on grill, rotating 90 degrees after 30 seconds if you want those grill marks, and sear 30 seconds more. Flip, and repeat. Serve with mashed potatoes and a veggie for the best meat and potatoes dish you can imagine!